An ambitious script, set in various countries, AGENT VINOD is by far the most credible secret agent movie made in Bollywood. This hi-octane thriller has style and substance, both! 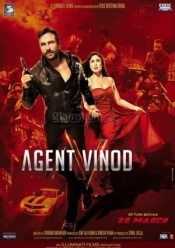 On the whole, AGENT VINOD is a hi-octane espionage thriller with a heart. It is not just brawny and dynamic, but witty and crazy too. Ultra slick and stylish, this desi Bond movie adheres to the formula and succeeds in meeting the humungous expectations. AGENT VINOD has all the potential to develop into a triumphant franchise! After making films like EK HASINA THI and JOHNNY GADDAAR, Sriram Raghavan returns with yet another intelligent thriller that doesn't disrespect the astuteness of the moviegoer. As a matter of fact, you need to watch the narrative unfurl with a vigilant mind, since this is one of those films that demands your concentration. While I have listed the several winning points of this film, I'd like to add that Sriram himself is the vital USP of this endeavor. His method of exemplifying the anecdote is way too varied from the prototypes. Drifting away completely from the Bond movies of swanky cars and cool babes, this one is more about electrifying thrills along with a lot of wit and intelligence and a garnishing of the desi tadka. The nuggets of the quirky humor injected in the plot work incredibly well. Vinod [Saif Ali Khan] is the kind of agent who first kicks the door open and then finds out what's behind it. His unconventional approach puts him in perilous circumstances, but he manages to get the decisive leads. Vinod is sent to Moscow to investigate why his colleague was killed. Vinod finds out that a Russian money launderer Abu Nazar [Ram Kapoor] has sent US$ 50 million to a contact in Morocco, for an operation against India. Vinod leaves for Morocco, where he meets an elderly Mafiosi Kazan [Prem Chopra] and the beautiful but mysterious Dr Ruby [Kareena Kapoor]. A series of twists and turns take Vinod across the globe from Marakkesh to Riga, Karachi to Delhi and finally, London. Where he discovers the ultimate conspiracy.